It’s finally Spring, April, almost summer, you know whatever you want to call it, it’s finally here! And do you know what that means? 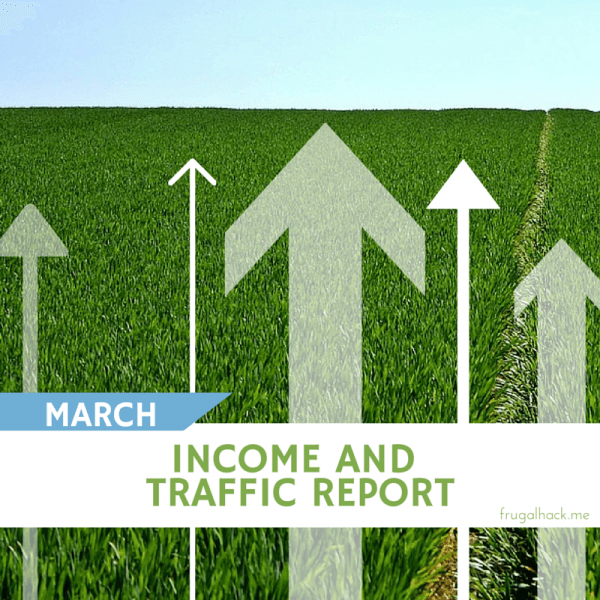 A new traffic and income report, of course! This month saw a lot of “new” in regards to hosting, moving, traffic, and more, so get ready for the excitement! Every month, I post the previous month’s income and traffic received on this blog. Why? Because I feel it’s important to stay transparent and accountable for everything I post. Blogging is definitely NOT a get rich quick scheme, regardless of what most people think. My goal is to highlight that and show you the statistics, because they’re very interesting! My March traffic was pretty consistent with January and February, which is good and bad. It’s good, because it didn’t decrease [much], but it’s bad because my goal is to increase my readership not stay the same. The reason I expect that my traffic didn’t increase this month is due to my decrease in posts. My post count only went down one (18 to 17), but that has a huge effect on my daily traffic. After all, who wants to read the same article two days in a row? Unfortunately, I expect this trend to continue in April, since I am still in the process of moving, but once that all gets wrapped up, I hope to start posting more. In the mean time, if anyone is interested in writing a guest post, that option is open. Money Order Prices and Locations – Shocker right? This is the top post every month thanks to Google. Load Serve With a Debit Card or Credit Card – This is a great way to add some extra manufactured spending to your monthly routine, however, sadly the credit card option will be going away in April (at least for Amex cards). What to Do With $200 Gift Cards – All the office supply stores sell them, but what do you think the best way to use them is? The Intermediate Guide to Manufactured Spending – Manufactured spending is a fickle beast that is quite hard to tame. If you’re relatively new to the world of manufactured spending, but you’re getting the hang of it and you want to take it to the next level, this is the post for you. Send Money From Serve to Your Bank – This is by far one of my least favorite uses of Serve, but to each their own. This month I decided to switch hosting companies after a little encouragement from your comments and the unreliable, expensive hosting Bluehost offers. I’m now with SiteGround, which has proven to be much better in all areas. The hosting is cheaper, the servers have yet to go down (my Bluehost server went down 3 times last month), and their support is phenomenal. I’m extremely glad I actually switched! -$167.40 – A year of SiteGround hosting. -$9.02 – Domain transfer to NameCheap. +$66.20 – BlueHost pro-rated refund. -$110.22 total hosting expense for the year. This month wasn’t perfect, yet it wasn’t the worst either; It was simply just another month. Once my life gets back to normal from the move, I’m sure things will start picking up around here. As for concluding this report, I just want to say thanks for sticking with me all these months, commenting, clicking my links, and simply reading my blog. You guys are awesome! Without you, this blog would be pointless. So, thank you!